An important study was just published by VocaLabs, a consulting firm that specializes in call center customer feedback. The top three things customers associate with good customer service can be summarized as "make it quick and easy to reach a person, and make that person polite and professional." 50% of survey respondents selected all three of the top three factors. 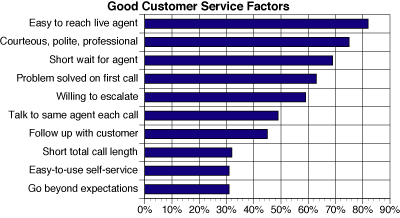 Among the top items on customers' wish list are the ability to reach agents easily, politeness and courtesy of agents, short wait times, and the having one's problem on the first call. Elaborating on my post of yesterday regarding the troubled waters Gethuman is navigating, I think the key to building a reform movement that will take hold and have a concrete and lasting positive impact is to assemble the right alliances from stakeholders who have a vested interest in pressuring businesses to invest in customer-centric solutions. If you look back at all progress say in product safety that has been made, in almost every case, it has been a battle between on the one hand businesses that want to protect their short term interests and their margins by resisting anything that leads to production cost increases, and on the other consumers and their advocates who moved to pressure them to build safer products. The classic example being of course the car seat belt and Ralph Nader's crusade for automotive safety. Initially, there was great resistance to the seat belt, but eventually, companies realized that safety was a competitive advantage they could exploit (and did). And that turned out to be great not only for the companies who went the safety route, but for the automotive industry in general because it opened up a whole new market and new set of customers (safety conscious Moms) who had up to then been excluded. The stakeholders in our case are consumers and their advocates, VUI designers (we want to have jobs and make money), companies that deploy IVR solutions (they want to build applications that will be adopted have a truly positive impact for their clients), integrators, companies that host the deployments, and companies that buy them and deploy them (our customers). The challenge in our situation, I believe, is that the ultimate user is not the technology buyer, so, obviously, the interest of the buyer is not aligned with that of the consumer. (1) Educate consumer groups on the shabby state of deployed automation and support. That shouldn't be too hard given the universal dislike of currently deployed IVR systems. (2) Educate consumer groups on the possibilities of the technology: they need to understand that a great deal of consumer pain can be alleviated if businesses invested in the deployment of quality speech solutions. (3) Have consumer advocates pick one or two key features that can be delivered and that are most wanted by the consumer and agitate for their adoption. For example: telling the caller how long they need to wait when they are placed on hold, or never having the caller repeat information they give the agent. (4) The features in (3) need to be (a) easily implementable (technology exists and it is not too expensive), and (b) easily monitor-able. (5) Have the consumer groups establish watchdog units that will monitor and mobilize when the key feature in (3) is absent from an application. (6) Enlist legislators that will serve as a Democles Sword. Nothing mobilizes an industry to do the right thing than the threat of legislated regulation. (7) Build capacity: i.e., make sure that the supply of VUI designers meets the demand for them. way to go but up. Establishing a consortium of some sort that speaks on behalf of businesses that deploy IVR solutions would be a concrete first step to take. A piece in Businessweek discusses how and why the gethuman project has not lived up to the revolutionary promises it made when it was launched in late 2005. What happened? English learned that no matter how effective online consumer crowds may be, full-blown change still takes the passion and energy of committed individuals. "If you're going to try to do a standard," he says, "you need someone who is really going to drive it." English admits his busy schedule as chief technology officer of fast-growing travel search engine Kayak.com played a part in the slowdown, but he never intended the site to take up much of his time in the first place: "I wanted the citizens of the Web to run this." Leading a movement is a thankless task that requires a great deal of passion and selfless sacrifice. I suspect that Microsoft and Nuance pulled one of the oldest tricks that establishments pull when they need to neutralize an agitator: flatter them and pretend to join them. Also: I think the main reason that English lost steam is that he had no strategy for reform: he agitated and that was that. Agitating is useful and necessary. But reform requires a long-term program with the patient building of allies and the steady shaping of opinion. But I don't think his efforts have been in vain at all. The movement truly needs to be picked up from within the industries that deploy Speech IVR solutions with bridges to consumer watch dogs to put steady pressure on companies to invest in the deployment of quality speech solutions. Continuing with my reading of Bruce Balentine's book. I am now in the thick of his argument against building "bad humans" and for building "good machines" -- this is articulated explicitly in essays #94-#97 (pp. 265-279). I've expressed in a previous post my sympathy with the core idea of moving away from the paradigm of building machines that mimic humans and towards a more grounded paradigm where the focus is on helping people solve problems as efficiently as possible. There are several tensions that have come up in this proposition, though, which I will tackle in the next few posts. Here is the first: I am not comfortable with the neat dichotomy that Balentine seems to rely on between form and content. He seems to suggest that there is a clean way of slicing off "useless fluff" (my expression) and getting to the heart of the matter that is just as effective as language with "the fluff." Example: should a system say "thanks" after you give it a piece of information it asked for? From what I can tell, that's a bit of the machine trying to sound human, as far as Balentine is concerned. But in my view, the "thanks" is not "just" an expression of gratitude (which, granted, is primarily a social transaction). It also serves the functional role of alerting you that the system has heard you and that it has accepted your input, and that the interaction was completed successfully. How about this one: the system is retrieving information from a back-end and things are taking a bit longer than usual, and so it says, "Sorry for the delay. Looks like the system is slow today." Is that too much anthropomorphism? Too much chit-chatting? I don't think so. It's very useful information: tells me that the system is still working on things and that it is indeed slower than usual. And you know what, I don't mind the fact that the system "realizes" or acknowledges that I don't like waiting. Not that I am fooled into thinking that the machine has feelings. And yet, I like the "sorry" message. It is useful. A blog I have started reading recently is Service Untitled. This is a great, active blog to read, with lots of very useful insights and information from people who truly care and think a lot about customer service. Very interesting how the 5 requirements above closely match to some best practices in phone self service: (1) don't hide the zero out option, (2) use information that you can gather about the caller and the context to serve them intelligently, (3) get feedback from callers and monitor caller satisfaction, (4) offer accurate information and solve caller problems, (5) make sure the call flow is coherent and rational (for instance, don't drive people crazy with jumbled menus full of holes - "For Support, press 1, for sales press 7, for billing press 5," etc.). See more about this in an article I recently published in TMCNet: "Treat Humans Humanely and they Might Just Like IVR". A piece we wrote for the ASRNews newesletter came out earlier this week. Here it is reproduced. Please consider subscribing to the newsletter. It's chock full of must know information. System: Hi there! The last four digits? System: Ok. Hang on. Your balance is $5,235 dollars and 23 cents. Anything else? At which point you would flip your cell phone shut and then rollback to sleep. The whole interaction would have taken you between 20 and 30 seconds, no more. Compare this to getting your information from the web. If you are like us and you use a desktop at home, it means you would have had to get out of your bed, walk to the room where the desktop is, turn the computer's monitor on, click on the tab that points to your bank's login page, type the login credentials, and then navigate to where your checking balance is displayed. After that, you log out from the account and bring the browser down (to minimize any security risks), switch the desktop's monitor off, shuffle back to your bed, and finally get back to sleep. At the best, it would have taken you between 4 and 5 minutes. What if you had a laptop? Well, maybe you would be able to shave a minute or so off, but only if you had the laptop nearby and it was connected to the Internet (which probably means that you have WIFI at home). What if you had a PDA (Blackberry, Palm, iPhone, etc.)? You wouldn't have had to get up from your bed, right? Yes, but have you tried navigating the Internet with any of those devices? At best, it is less than a gratifying experience, but usually it is downright painful. The iPhone has made great strides over its other PDA competitors in the display of web pages, but it took a step backward in information entry: it is relatively easier to type with a Blackberry or a Palm than it is with an iPhone. "Relatively easier," because typing with the Blackberry or the Palm is no trivial skill to acquire. So, then, it turns out that the most cutting edge technologies (desktops, laptops, PDAs) do not compare well at all with our humble phone when it comes to the simple task we described above. What does it tell us? Simply that IVR technology is here to stay. It is here to stay because for certain tasks, it can do the job cheaper, more quickly, and require less effort on the part of the end user, than any of the most cutting edge communication technologies out there today. But then you ask: so why do people hate IVRs? Why do they groan and shake their head in dismay when they realize that they are about to interact with a machine over the telephone? The answer is simple: because most IVRs are atrociously designed. The interaction we described above is not your typical exchange between a user and an IVR system. Your typical IVR would have greeted you with some 30 seconds of chest-thumping messaging about the company, followed by some mindless instructions, such as, "For English, press 1," or "Please listen carefully as our menu options have changed;" would have listed a long menu of options, would have required you to select the "check balance" option, then the "checking account" option, then would have required you to enter your full checking account number, then, for security purposes, a pin, and only then would have finally given you the balance. A grueling 3 or 4 minutes would have gone by – and you would have had to get up from your bed and retrieve your checking book, unless you were so organized as to have the checkbook near by, or had committed to memory your 14-digit checking account number – etc! So, what did it take to have the IVR system we described initially to behave as it did? Here are the keys to its effectiveness: (1) it recognized who the caller was, (2) it knew that they were calling to retrieve their checking account balance, (3) it did not waste time talking, but said only what it needed to say, no more, and (4) it let the caller speak back their answers. Can this interaction be implemented with today's technology? Absolutely. With the caller ID and the last four digits of the caller's checking account (easy to memorize, especially if you are calling once a week), the user can be identified and validated, and the checking account balance retrieved and spoken back to the user in a matter of seconds. With some intelligence in the back-end (a simple Naïve Bayesian algorithm would amply do), the system can quickly learn by itself that every Saturday morning, this particular customer will call to ask for their checking balance. With that knowledge, the system can adapt its interaction to shorten all of its verbal prompts to the bare minimum (e.g., "The last four digits" rather than "The last four digits of your checking account number"), ask only for the information needed to accomplish its task, and then execute that task. And with the current state of Speech recognition, letting the user speak back the last four digits of their account and say "No" are trivial tasks. There is no reason, then, why every IVR system deployed out there today cannot be as effective as the one described above. Give the people a system that helps them, that solves their problem without wasting their time, and they will use it and love it every time. I suggest that next time you find yourself in a position of having to explain why you do not agree to including the prompt, simply explain your position as follows: Power users do not listen to prompts, and will certainly not notice the white noise language of "Please listen carefully as our options have changed" -- especially if it is played every time they call. The only way they will learn that an option has changed is for them to get lost once or twice. If there was indeed a drastic menu change and you desperately needed your callers to notice it, use something far more attention grabbing than some language signal the change (a double dings sound followed by an announcement that menu options had changed) -- and use it only when something has really changed, and for a limited period of time. And if you were really smart and cared about your callers, you would remember who has already listened to the menu change notification and so does not need to be bothered with it every time they called. "You can interrupt me at any time"
"Please select from the following menu options"